Went to Lakeshore Learning today to get some borders for my room. I saw this great fraction game as I was walking out, but there was no way I was going to pay $24.95 for it. So I created my own version of it! And I am so happy with it...hope my kids enjoy it too. Click on the preview of it below to download the game...enjoy! Thanks so much for this. I was thinking of making a similiar activity soon so you've saved me heaps of time! These look great! Thanks for saving us some money! Thanks for this-it look wonderful! Thanks ladies, so glad you were able to use it. I really like the way you have explained the fraction match up! I am so jealous that you have a Lakeshore store near you!! Your game looks great! Thanks for sharing! Thank you so much. 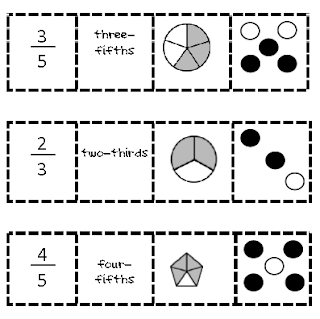 I like how you covered all of the possible ways to see the fraction. This is PERFECT and I appreciate it so much! Just what I was looking for! Thank you for sharing this. We have used this game in our homeschool and I have linked your page on my blog. I can't seem to download this. Ever time I click on the preview, it just brings me to a blank page. Any ideas?